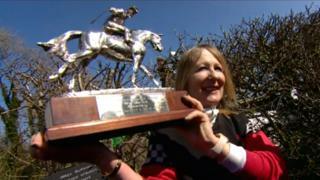 Dozens of riders have taken part in the 500th anniversary of England's oldest horse race. The Kiplingcotes Derby has been run every year near Market Weighton, East Yorkshire, since 1519. Its four-mile cross country course includes farm lanes, tracks and public roads in the Yorkshire Wolds. This year's race was won by Tracey Corrigan on her horse Frog, who beat a record field of 36 competitors to lift the trophy for the fourth time. Ms Corrigan said she was "very upset" as the horse she intended to ride in the race had died after breaking his leg a few days ago. She added: "There's no skill left to it now, no skill to riding it. "Before you had to pick which puddle to go through, but now it's just perfect." Race trustee and retired farmer Guy Stephenson, 86, said the annual event attracted spectators from around the world. "We have a family of eight coming over from Canada whose ancestor lived in Middleton-on-the-Wolds in 1519 and they're thinking he might have been at the first running," he said. Mr Stephenson said the race had been a tradition in his family for the last 100 years, with family members either winning the race in the previous years or owning the winning horse. A set of race rules discovered in a bank vault gave the start year as 1519, when King Henry VIII was on the throne. One of the regulations is that if the race is not run one year, it must never be run again. Last year a waterlogged course meant a volunteer had to walk a horse along the route in order to keep the tradition alive.